Deadeye Brightland’s creepy hologram of Sadie. The entire time I was playing beta weekends and then eventually open beta in Wildstar, occasionally I’d hear a guildie (who was almost always a woman) saying, “Gosh, I just hate this quest.” It was pretty remarkable as everyone seemed to generally like, if not tolerate the quests in Wildstar. Every single time, the quest in question would be the story from the Northern Wilds zone involving the ship taking survivors to Thayd. Namely, Sadie Brightland dying in a spaceship. Deadeye looking for his wife is literally the first thing you are aware of in the game when you roll a new character. The reason you are brought out of cryo-sleep is because Deadeye thinks it might be Sadie. 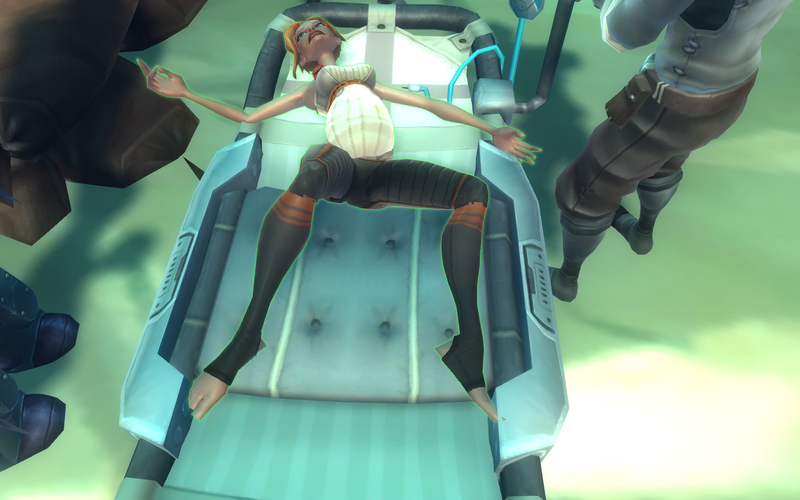 Let’s not discuss why a pregnant woman is in cryosleep. In the questing, Deadeye figures they can get people who have been badly hurt to Thayd via a working jump ship that’s coming to rescue them. Thayd is not that far, so don’t ask me why this is necessary. Ship comes and picks up survivors (you see generic models going into it) and before it’s 3 feet off the ground, it gets somehow utterly demolished by Dominion forces who just happen to be close enough to know that there’s a ship there and didn’t blow it up before then. Turns out that Sadie was on that ship, despite not seeing a stretcher or her model being helped onto it. You know this because Deadeye mentions it almost idly in quest text immediately after. This is what fuels Deadeye’s thirst for revenge in the narrative for the rest of the time. This is weird on almost every conceivable level, which makes Sadie’s death even more unforgivable. But let’s talk about what’s going on here, first. As most people have recognized by now, it looks like Sadie is more than just a victim of cryo-sickness, but rather the Women in Refrigerators trope. Sadie’s story is not central, not developed in any way, because it is actually Deadeye’s story. Sadie isn’t developed as a character, because she’s a prop and her death is meant to instill feelings and action to our actual protagonist. In a way, two people are dying for the price of one here and it’s pretty weak all around. Pregnant wives being shuttled off to non-existence or death seem to be popping up recently and I don’t like it one bit. The part about this that makes me really annoyed is that other more lore-savvy Wildstar players found that there were earlier mentions of Sadie’s life in one of the Tales books. 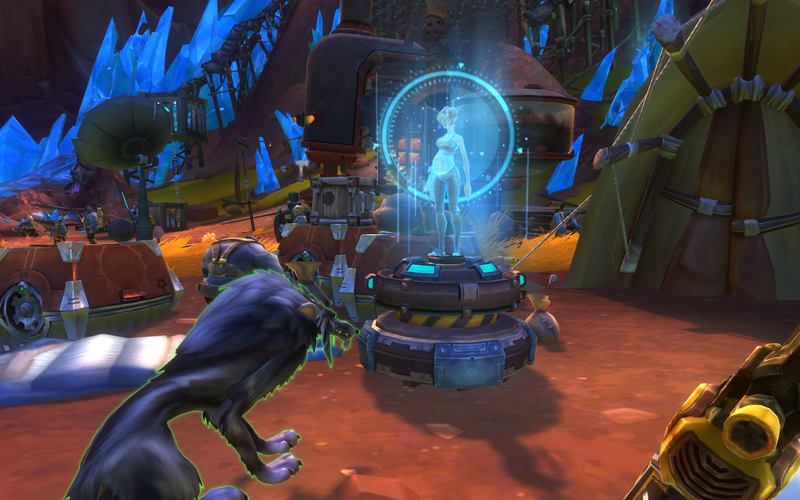 According to this, she was a Justice (Wildstar equivalent of a galactic policewoman, I believe.) I don’t know whether this is writers throwing players a bone or what, but it’s a key to creating an actual three dimensional character that they are never going to use now. And barely anyone will ever know it’s in the game at all. Sadie as she stands now has been nothing more than a tool or a prop to create angst in Deadeye, a man who admittedly a) has a very weak reaction to seeing his wife and unborn child killed before his eyes b) needs literally no reason to hate or kill Dominion. He seems only vaguely sad but still has weird hologram of her at a camp immediately after. It’s used to further his need for revenge, which is part of the trope but he would have shot Dominion anyways. Part of faction conflict is that it’s two groups of people fighting over resources. You don’t necessarily need revenge to drive that story forward, much less senseless death. In the eyes of the Exiles, the Dominion are a pretty awful group of people. You wouldn’t need overly justified reasons to hate them outside of the ones you hold already. This forces an already flimsy story further into being pointless. Sadie died for nothing, without much of her own life. Pushing aside the sheer implausibility of the ship blowing up in the first place, what really made me confused is how well the parallel quest in the Aurin/Mordesh starting zones works in making you, as the player, feel hatred towards the Dominion. You go to all this trouble to help awaken a tree that’s been infused with Eldan technology and it might hold the secrets that the Aurin and the Mordesh both desire to hear, especially about the disappearance of the Eldan. Chua come along right as the tree is going to speak to you via a communicator panel and blow it up. I felt legitimately upset about this! I did not feel this way about Sadie. Nothing about Deadeye’s very discreet reaction or the story-line felt believable or emotionally purposeful. It was very flat and out of left field. There’s nothing there that makes you feel for the Brightlands. All it did was reinforce this idea that gaming in general has a problem with how they use women characters as emotional speedbumps for the male protagonists. The reason I think a lot of people felt that this quest line in particular stuck out like a sore thumb is because you really don’t expect it in a game like Wildstar. Nothing about the game, despite having warring factions, suggests a particularly grim, tragic tone. Women are pretty present in a lot of ways, especially if you play through Aurin zones. Having an actual matriarchy in the game that works suggests the idea that the creative development team grasps the idea that women are a realistic and needed part of diversity in the lore. Seeing one be killed off for the benefit of one guy seems really immature and in contrast to that competency you see everywhere else. Granted, people have been upset about this since December and nothing has really been done about so I doubt we’ll see any movement on this, but it just bears remarking upon. This isn’t just a problem that just Wildstar has, but more that it is a problem that writers within gaming and even larger popular nerd culture have. But it does make me sad to see it turn up so soon in a new video game that I have been enjoying otherwise and has been doing a decent job making me feel like my female character is part of the world. Sadie could have been such a great character. A policewoman, living on the edges of space with her husband and pet wolf, with a new child and all the problems that come along with that kind of settler life (a life that many, many women have lived in real life before, even) combined with intergalactic war? How neat is that? Categories: Beta, Feminism, Gender, Lore, Women in the Nexus | Tags: cryo-sickness, dead pregnant women, dead women trope, Deadeye Brightland, killing off girlfriends, killing off wives, misogyny in gaming, misogyny in lore, misogyny in writing, pregnant women dying in stories, Sadie Brightland, Sadie Brightland's death, using women as revenge plot devices, Wildstar, women as props, women in refrigerators | Permalink. I never saw that model of her on the stretcher like that. And now I can’t unsee it. This whole thing just seemed so out of place in a game that otherwise has pretty interesting stories and women characters. Ugh. I completely forgot to take screenshots of this, but I remember sticking close to Sadie’s NPC when she was in the camp at Northern Wilds, and the in-game dialogue went on about her going into labor–something similar maybe–, and want Deadeye to be close to her, and the med-bot noting that she was really ticked off. I got really sad, when it was mentioned in the cinematic that she was on the aircraft. I couldn’t believe it, and I thought she survived because it seemed so shoddily done. Later on, when you move from the zone into the next one, you hardly get much mention of her from her or Deadeye’s old enemy. I must admit I never got any further into Sadie’s albeit brief story than the starter quests but she almost put me off continuing any further. Why oh why, just once couldn’t have it been the other way around.